For those readers too young to remember, the first US Festival took place over Labor Day weekend in September 1982. Held in San Bernardino, California the event was sponsored by Steve Wozniak, the co-founder of Apple, with the music end of things handled by veteran promoter Bill Graham. Ever the visionary, Wozniak felt that if the 1970s was the “Me Generation” then the decade of the 1980s could be the “US Generation,” and the festival was conceived to combine music and technology and to encourage people to be more community-oriented. Wozniak paid for the bulldozing and construction of a state-of-the-art venue for the event, which was held during some terribly hot weather and resulted in a loss of around $12 million. Graham lined up some heavy hitters for the festival, and the diverse group of artists performing included punks and new wavers like the Ramones, the Cars, the Talking Heads, and the Police as well as classic rockers like the Kinks, Santana, Fleetwood Mac, and Tom Petty & the Heartbreakers. A second US Festival was held over the Memorial Day weekend in May 1983, with promoter Barry Fey taking the reins and Wozniak again paying the bills. The second festival featured some repeat performers from the first, including the English Beat, Oingo Boingo, and Stevie Nicks, performing solo. The Memorial Day event eventually conceived as a three-day festival, with performers on each day slotted under “New Wave Day,” “Heavy Metal Day,” and “Rock Day” but a fourth “Country Day” was added. Performers at US2 included the Pretenders, Ozzy Osbourne, Judas Priest, U2, Van Halen, David Bowie, Willie Nelson, and Waylon Jennings, among others. The second festival also lost a reported $12 million but, taken together, the two events proved to be enormously influential on a generation of rock fans. 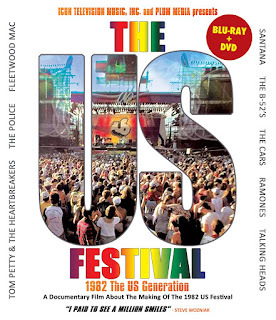 The festivals have been sliced and diced and released on home video in various formats, with individual performances by Triumph, Quiet Riot, the English Beat, and Willie Nelson released. The festivals evidently had a profound effect on award-winning filmmaker and rock ‘n’ roll documentarian Glenn Aveni, who had previously made An Ox’s Tale: The John Entwistle Story. Working with co-director Jay Cedarholm and producers Bruce Gibb and Rich Schmig, Aveni has created The Us Generation: The Making of the 1982 US Festival, an in-depth look behind the scenes at the influential rock festival. Scheduled for August 10th, 2018 release on DVD and Blu-ray disc by MVD Entertainment, The Us Generation is the authorized (by ‘Woz’) story of the 1982 festival. The film features re-mastered live performances by artists like Tom Petty, Fleetwood Mac, Santana, the Cars, the Police, Fleetwood Mac, the B-52s and others, and if that’s not enough to convince you to add check it out, the film also includes interview footage with Steve Wozniak, Mick Fleetwood, Eddie Money, Marky Ramone, Stewart Copeland (The Police), and Mickey Hart (The Grateful Dead), among others. The two-disc Blu-ray is going for less than $20 on Amazon so what are you waiting on – this is an essential addition to any fan’s collection of rock ‘n’ roll documentaries.